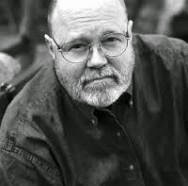 I came to Steve Hunter somewhere in mid-career - I mean his - when I read HOT SPRINGS, which came out in 2000. The next book I read was DIRTY WHITE BOYS, which had been released in 1994. Then, like a lot of us do, I went back and started at the beginning, with THE MASTER SNIPER, from 1980, and read the rest of his novels in order. Although some of them are stand-alones, most of them focus on a Marine sniper, Bob Lee Swagger, who saw combat in Viet Nam, and his dad, Earl, a Medal of Honor winner in the Pacific war. And the books cross-pollinate, in the sense that some members of the cast have running cameos. My own personal favorite in BLACK LIGHT, and when I suggested to Hunter in an e-mail exchange that I guessed his own favorite was TIME TO HUNT, he admitted it was true. My reasons for liking BLACK LIGHT are its nimbleness and canny plotting, and I think Steve's reasons for liking TIME TO HUNT are about emotional resonance. I have to say that a couple of the recent Bob Lee books left me somewhat lukewarm. DEAD ZERO and SOFT TARGET let a little too much of Hunter's politics leak in. I could say the same of John LeCarre, in all fairness. Hunter's somewhere off to my Right, and LeCarre more to my Left. (I found ABSOLUTE FRIENDS enormously irritating.) Samuel Goldwyn is supposed to have once said, "If you want to send a message, use Western Union." Mind you, I love the gun stuff in Hunter's books. I got no issue with it. But everybody doesn't feel the same way. He tells a story where somebody said to him, Gee, they liked the books, but they got bogged down in the guncraft, and couldn't there be less of it? Which reminds me of a Tony Hillerman anecdote. When he pitched the first of his Navajo mysteries, THE BLESSING WAY, one agent came back and told him, This is pretty good, but can you get rid of all that Indian crap? I guess you have to take the bitter with the sweet. 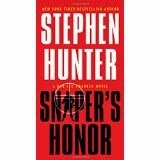 Which brings us to SNIPER'S HONOR, out this past year. Two linked plot lines. The first is the Ostfront in 1944, a Russian sharpshooter, Mili Petrova, and the second is Bob Lee in present day, trying to figure out how come her story had been erased from the historical record. And of course the stories collide. I happen to really like the device of shifting POV, with the past impinging on the present, not least because I've used it myself. (The bounty hunter novella DOUBTFUL CANYON has two interdependent narratives, told fifty years apart.) In the case of SNIPER'S HONOR, the game's afoot in Ukraine, and Mili and Bob Lee traverse the same terrain, with both similar and competing obstacles in their path. Mili setting up a thousand-yard cold-bore shot on a particularly loathsome Obergruppenfuhrer-SS - think Reinhard Heydrich - and Bob Lee tracking her from a distance in time, but seeing her boots on the ground in his mind's eye. This is some trick, too, and what you might call a lap dissolve, in movie terms, where you see the landscape mapped out, with a sniper's eye (or rather, two sets of snipers' eyes), and how their parallel approach to the target intersects. The suspense is killing me. Does she make the shot? You know better than to ask. You'll find out on p. 327, point of aim, range, trajectory, bullet weight, deflection - let's just say a few variables. What you really want to know is, though, is the Master Sniper back on game? I'm here to bear witness. There's a boatload of gun stuff, sure. I ate it up. There's one hell of a good story, too, at both ends. And there's just deserts. (I checked the spelling on that.) Is there anything more you need? 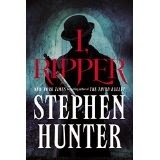 Well, the next book, I, RIPPER, is out this coming May. Knife work, I'm thinking. Gaslight. Cobblestoned streets, greasy with damp. Arterial spray. I can't hardly wait. That's one guy who can't be killed too often. Interesting article, David. I find myself picking up books you recommend and appreciate it.